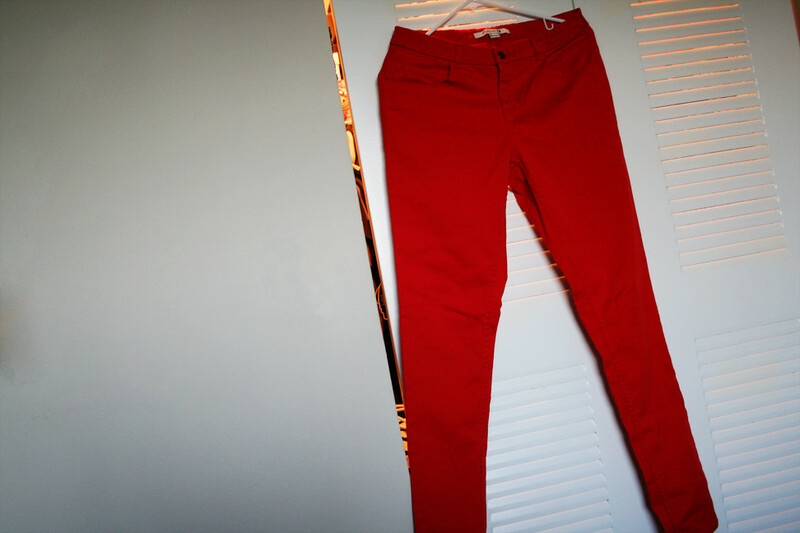 For the last year, I've been trying to hunt down a nice pair of red cotton pants. I didn't care too much about these being a "statement piece" or whatever -- I was mostly fixated with owning them since Thom Yorke of Radiohead regularly wears them during concerts. One thing I knew was that I didn't want to pay designer prices for them. I tried lots of places: Express, Forever 21 (in-store), Old Navy, Target... and either the red wasn't vibrant enough, the material was too spandex-y, or they were too skinny legged. When they finally arrived, something curious occurred: the red pair were very baggy, while the mint pair were very tight (like how they are pictured on the F21 website). I checked the labels and they said they were the same size, though. Let that be a caveat to you buying these pants sight unseen. 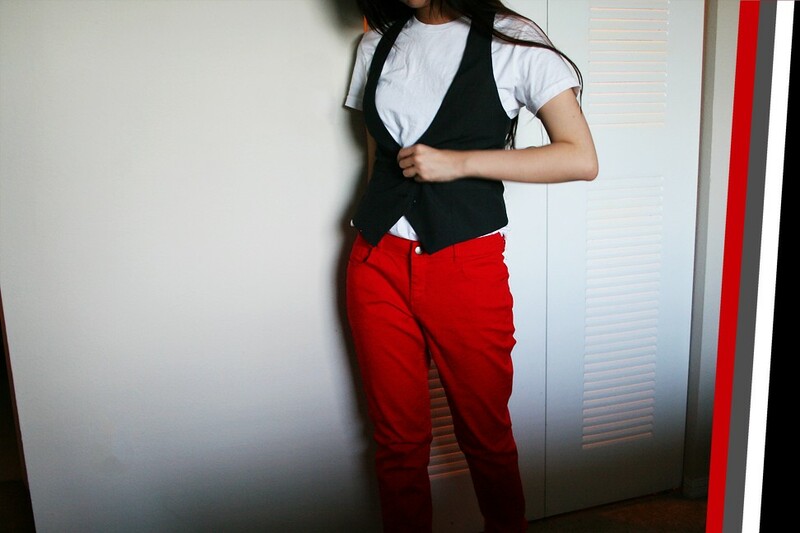 In honor of Thom, I found a white T-shirt (American Apparel) and my vest (Express) and threw my tribute outfit together. Yeah, they're really baggy, but I prefer that to tight in this particular color. I'll probably use a belt with these pants. The good news is that they were only $15.80 each, and I grabbed some coupon code floating around online for 10% off. I'd actually consider buying the other color variations of these pants, but I can't predict what sort of wacky sizing I might get next. If you're close to a F21 store that carries all the colors, you should try them on first, or at least be willing to return or exchange the ones you buy online. 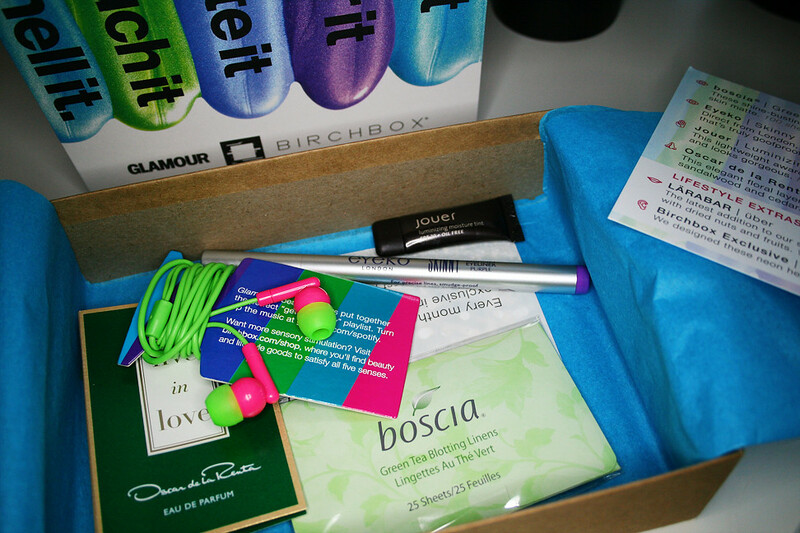 My July 2012 Birchbox* arrived this past Friday, and although I was excited when I first opened the box, after trying some of the things within, I was grateful that this is a sampling service. For those unfamiliar with Birchbox, you pay $10 a month to receive a box with deluxe beauty and lifestyle samples (with a full-sized item here and there). The best part is that you never really know what you're going to get -- every month they have about 30 or so variations on the box, so just because one person received a particular box doesn't necessarily mean you'll get the same box. *The link above is an affiliate link. Should you decide to sign-up for the service under the link, I will get points credited to my account. My Larabar was quite a bit soft and melted, so that went in the fridge as soon as I plucked it out. (I haven't eaten it to this day.) 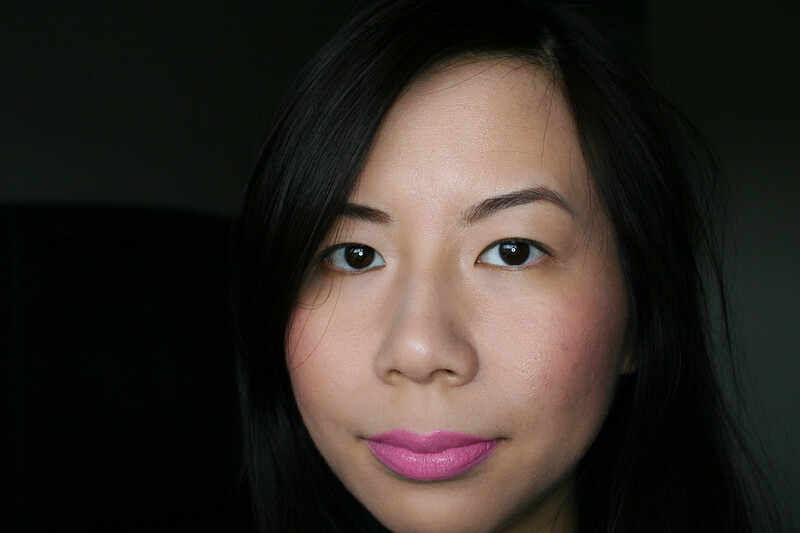 The Jouer Luminizing Moisture Tint felt nice (oil-free!) as I swatched it on the back of my hand, but as I rubbed it in, it was a shimmer explosion. No pictures, but I won't be buying this in the future. The Oscar de la Renta Live in Love EDP smelled nice (that is, it wasn't too offensive to me), but as I currently have too many fragrances, I won't get a full-sized version. It's woody and floral, nothing to write home about. I've tried the Boscia blotting sheets before, so I'll throw this package into my travel bag. I don't like earphones with little rubber canals. I'm terrified of this happening. Besides, I'm content with my Apple-supplied earphones for my iPhone, mostly because I like being able to navigate through playlists with the little control on the actual wire. 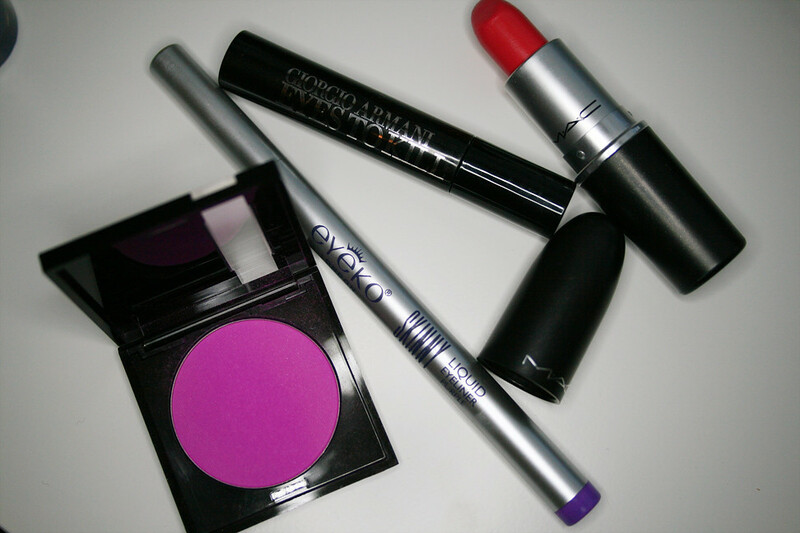 The full-sized product was the Eyeko Skinny Eyeliner in Purple. I swatched it on the back of my hand, and it held up really well -- no smearing or bleeding. So I then decided to put it to actual use. A couple of things before I begin: 1) I really don't like using eyeliners. I know my giant Urban Decay and MAC Fluidline collection might beg to differ, but I'll find other uses for them, like using them as a base or just as shadow. It's a combination of my lack of skill when it comes to eyeliners and that I just don't like the look of them on my face. If I wear eyeliner, I usually wear it alone without shadow. Maybe in a couple months I'll refine my technique. 2) I was testing a foundation shade here that's half a shade lighter than what I usually wear. I think it's a little obvious. 3) I also wore MAC Red Full-Stop on my lips, Giorgio Armani Eyes to Kill mascara, and a very light dusting of MUFE 26 on my cheeks. So with that all aside, I put the liner on my eyes. I purposefully did not wear eyeshadow primer or any other shadows on my eyes to test the longevity of the product. It went on smoothly and didn't tug too much, and it was easy to draw a quick winged liner look. It didn't look too bad for the first 30 minutes, but then my oily eyelids started revolting, and the liner started breaking down. By the end of the first hour, the liner had smeared all over. No pictures (sorry! ), but I'm sure you can imagine how it looked like. So while I was glad that I didn't seek out the Eyeko pen by myself, I'm a little bummed that I didn't get a box that had a Boscia BB cream or a BeautyBlender. Yeah, yeah, grass is greener. I'm not one to trade my makeup, so I'll keep what I got. Sorry for the post drought. I've been trying to play catch-up, though. What did I manage to do this week? I ate an entire bag of chips. Yes, I love new food flavors. 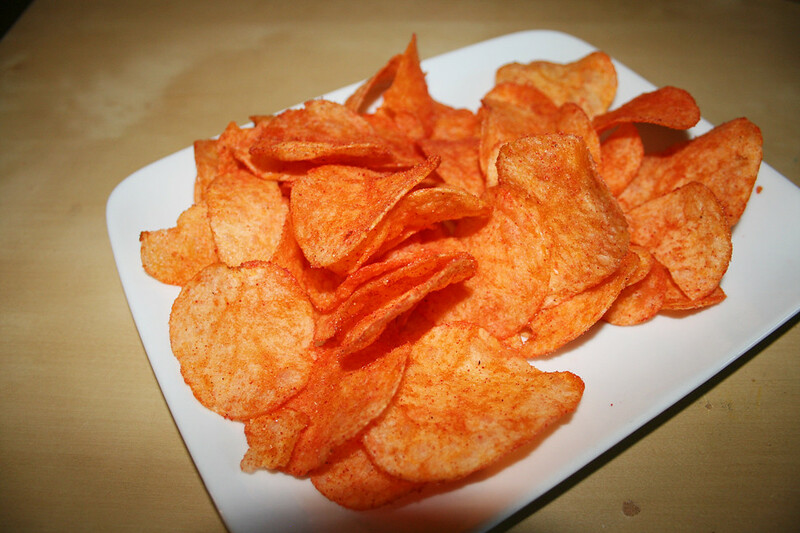 I'm still weeping over not being able to find Ruffles Loaded Chili & Cheese in my area anymore. Lay's Spicy Ketchup chips managed to catch my eye while I was at Target (whereupon I also stocked up on my favorite Ben & Jerry's only available there -- Volun-Tiramisu), so as with many things in that store, it magically fell into my shopping cart. 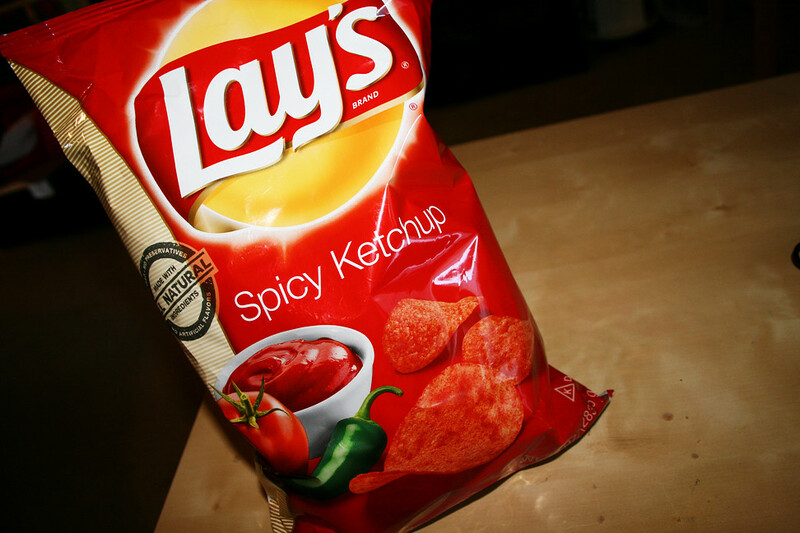 The ketchup flavor was strong, but as for the "spicy", it doesn't hit you right away until maybe 15-20 chips in (by then, I'm usually done with my one serving). Although I did manage to finish the bag, I'm not sure I would buy it again. 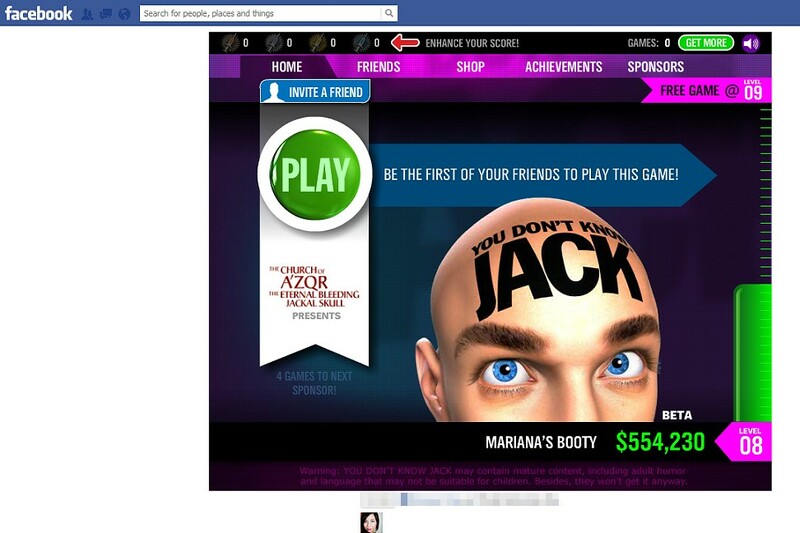 I also played a lot of You Don't Know Jack across several platforms (Facebook, Playstation3, and the now-discontinued iOS version). I spent 7 years in quiz bowl teams throughout middle and high school, and I begged my parents to get me the PC version of this game back in 1997 (They got me YDKJ Vol. 3). The Facebook version goes by very fast (5 questions versus the 11 on the PS3/iOS versions, and less than the 21 that used to be prevalent in the PC versions), and it's an asynchronous game where you "compete" with others who have already played the same "episode" at an earlier time. And even though it says up there "Be the first of your friends...", I actually have several friends who play the game (I don't know why it never updates to say "x friends are playing" or whatever). You can still see where your opponents/friends answered correctly/incorrectly, and how quick they rang in, too. All in all, if you like trivia with a hint of irreverence, it's a fun game -- my only beef is that you only get one free game a day unless you level up (which takes a while) or, of course, spend some money and use... Facebook credits. Ugh. 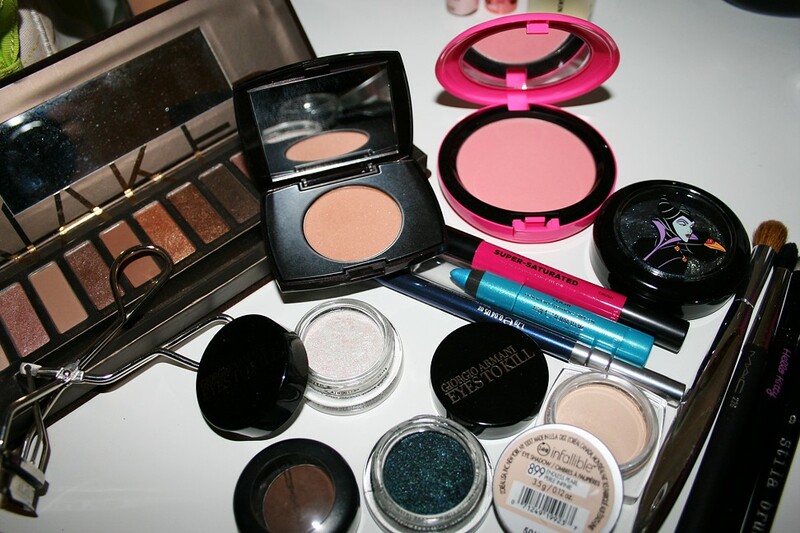 Finally, my beauty buys for this week. The Sally Hansen Insta-Dri is In a Flash, and it's actually a very pretty duochrome-ish/iridescent color reminiscent of mother of pearl. The Maybelline Color Show is Styled Out, a shimmery blue jean-type color (which dries a little satin-like). 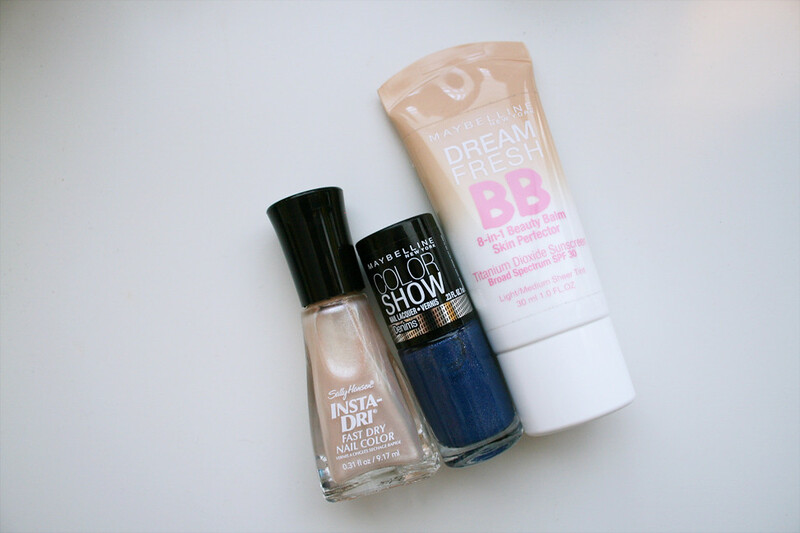 And at last, I found the Maybelline BB cream! I'll give it a try later, but I actually have a whole box of BB creams coming from Korea very soon (hopefully, as long as it gets out of the darn international sorting center in NY). Sweet deja vu, haven't I seen this post before? No, but close. 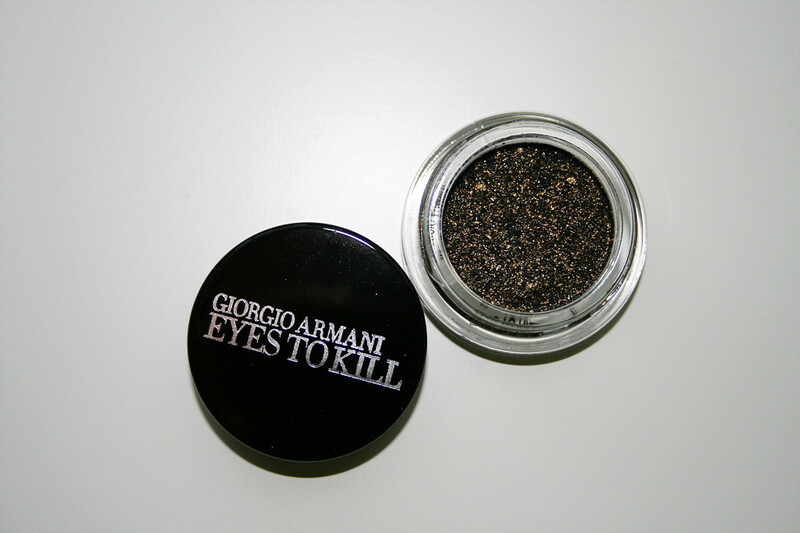 I went to Neiman Marcus to scope out the new limited edition Giorgio Armani Eyes to Kill Intense shadows. As far as I know, they only have number designations (no name), and there are six of them from #24 - #29. You can see the colors on Armani's website. I did swatch all of them in store, but the lighting there was pretty yellow, and I only had my iPhone. This is not a very good picture of them in real life -- the picture is far too warm and doesn't capture the nuances of each color. 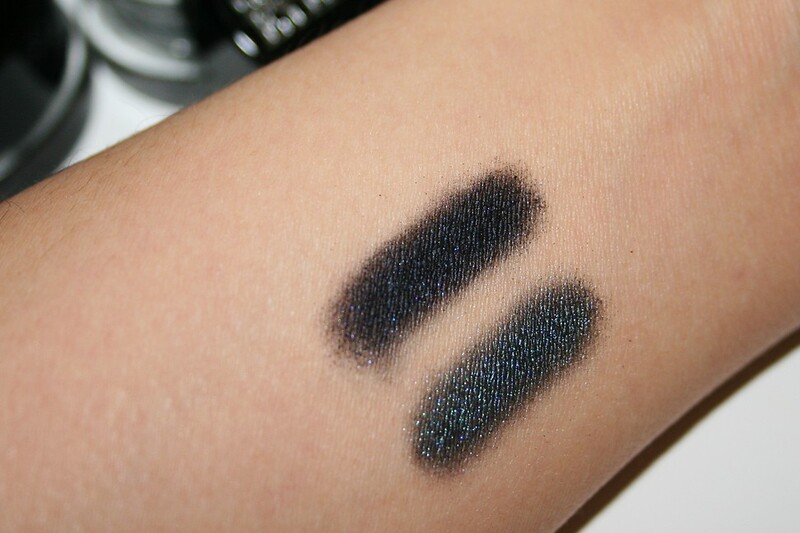 (For example, check out the differences of 25 in the hand swatch versus the arm swatch further below.) Nonetheless, here's the picture, but I'll try my best to describe them. On the website, 24 and 25 look very similar, but 24 is a much more gilded dark brown color whereas 25 is a dark blackened gold. 26 is a pretty straight on gold with slight light brown undertones. 27 is actually a nice mix of maroon and pewter -- it sort of reminds me a much redder 4 Pulp Fiction. (27 was my second favorite of the bunch.) 28 reminded me of a slightly darker version of Urban Decay's Baked, a sort of orange-y/bronze color. Finally 29 was a frost-like light pink. I know it sort of looks flesh-toned here, but it's the pink companion to 10 Airy Jade. I only picked up 25, but I think I will go back for 27. 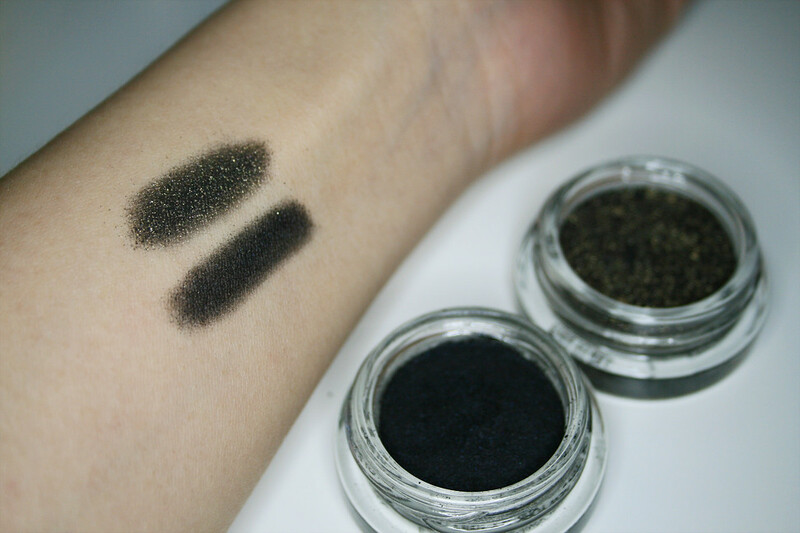 I didn't have a chance to do a face look with color, but once again, I compared the swatch of 25 against 13 Black. (If it's not obvious: 25 above, 13 below.) 13 is much more of a straight, almost matte black, but you can see the gold tones of 25. I'm not sure how it'll look on the eye, but I'll try to do a look with it later this coming week. I don't think I have a gilded black in my collection, or at the very least, I'm going to try to convince myself of that fact. Warning: This is a pretty lazy post. I haven't been feeling too well this week, so my topic well has run dry. There's always next week. Last month, I went to upstate New York for a friend's wedding, and on one of my free days, I headed to Buffalo, NY and Niagara Falls. 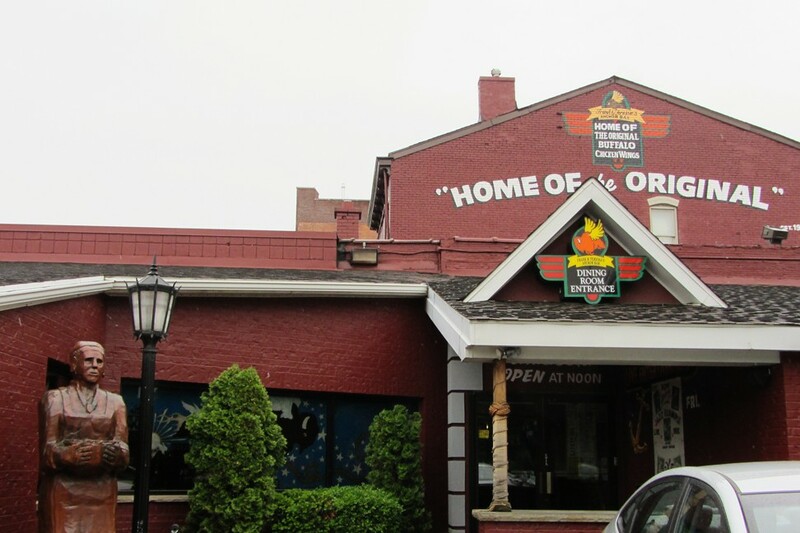 Unfortunately, it was a very dreary and wet day, but I made sure to stop by the Anchor Bar (the "birthplace" of "buffalo wings"). I believe it was a Friday afternoon, but there was only a 15 minute wait to be seated. 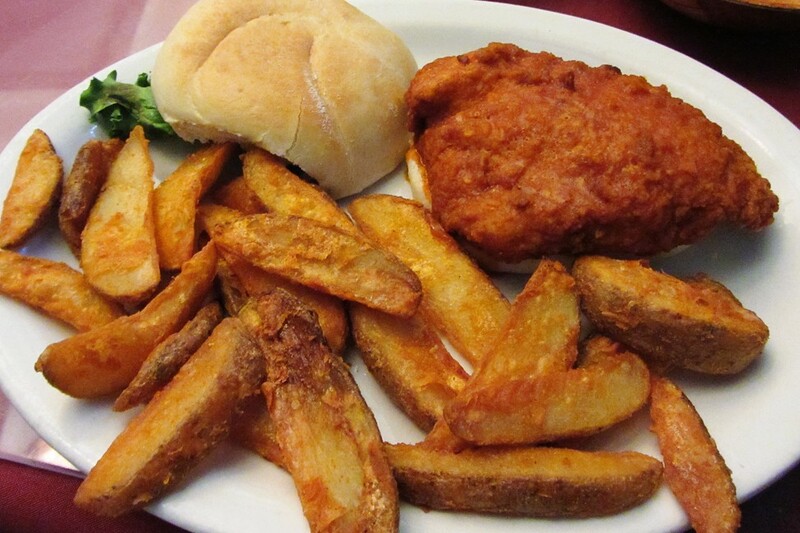 I'm not going to do a review of the place or the food there, but what you see is what you get. 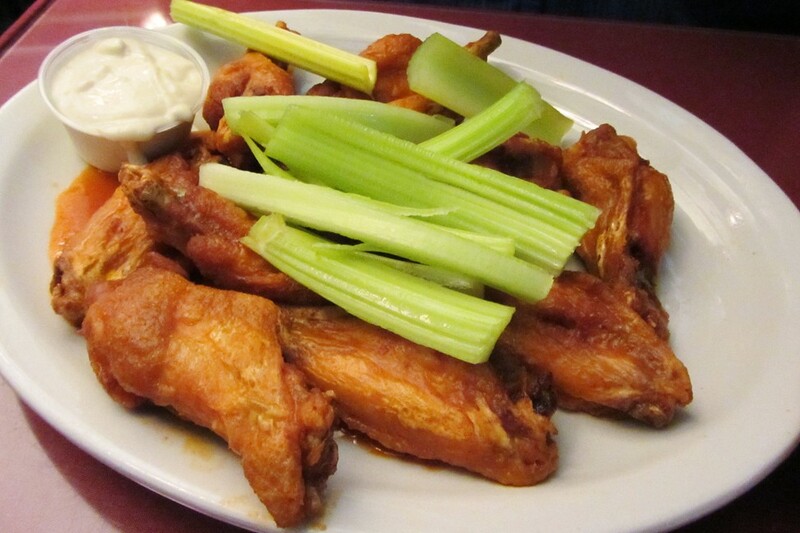 I think a lot of negative reviews from others stem from those who go there with high expectations, but let's be honest -- it's bar food. If not for the "authenticity" factor, I probably would have gone somewhere else for lunch. I think that's a lesson that I try to teach myself often when going to restaurants or events: lower your expectations, and you'll have more fun instead of fixating on a perfect experience. After lunch, we drove 20 minutes to Niagara Falls. Hey look, there's Canada! I didn't do any of the boat or walking tours since it was so wet and cold outside already. 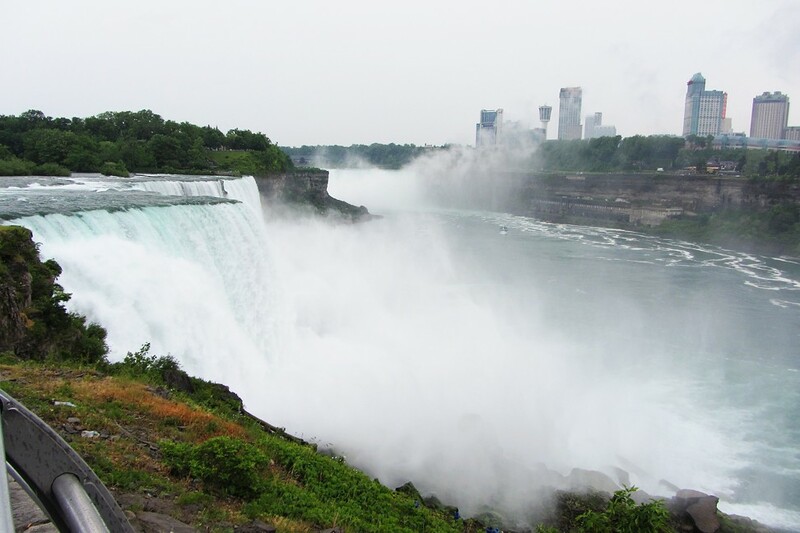 It's suggested that the Canada side of Niagara is much more lively and exciting than the US side. But based on what I did get to see on the US side (both of the actual falls and the "attractions" in the area), I'm going to assume it's true. The only thing that you can see real nice from the US side are the sweet rapids that lead to the waterfall. Did you know if you're a US citizen and you don't have a passport that you can probably get into Canada, but you won't be able to return back to the US? Not that I know from experience* or anything. 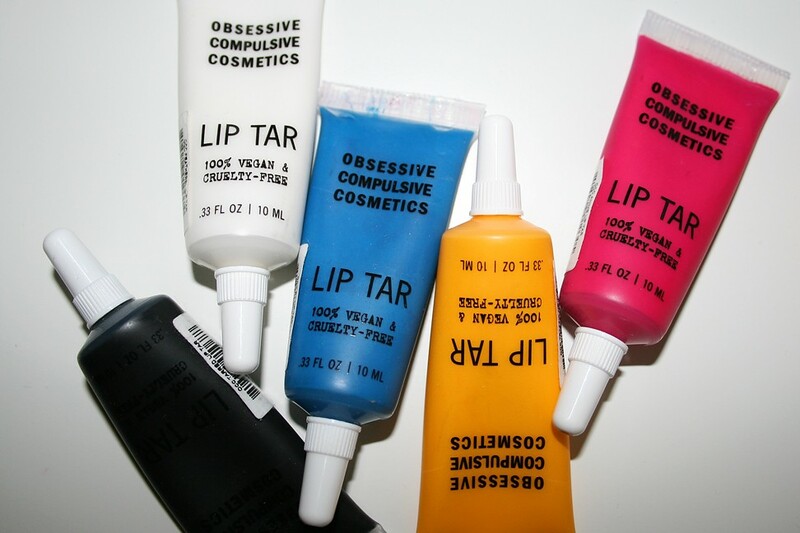 One of the best (and most fun) investments I've made this year are Obsessive Compulsive Cosmetics Lip Tars. I can't help but be reminded of mixing tempera paints in elementary school and discovering all the different colors you can create with just a handful of colors. OCC offers a wide range of colors in their Lip Tar line, and I bought 8 of these from Beauty.com* during their Friends & Family sale a couple months ago, including a blue (Rx), black (Tarred), and yellow (Traffic). *Although I would advocate getting the products direct from OCC's site, Beauty.com offers free shipping at $25+ and often has coupons/codes. Disclaimer: I'm not a Beauty.com shill, I just like a good (better) deal when I see one. Of course, while you can wear blue or green lip colors by themselves, the fun of these things is that they are meant to be mixed together. I bought the blue and yellow specifically to make other colors cooler or warmer, but you can wear many of their available colors alone without mixing with others (and without other people doing double-takes). I wanted a nice light pink, and because I also had a shocking hot pink (Anime), I mixed it with an equal amount of Feathered. 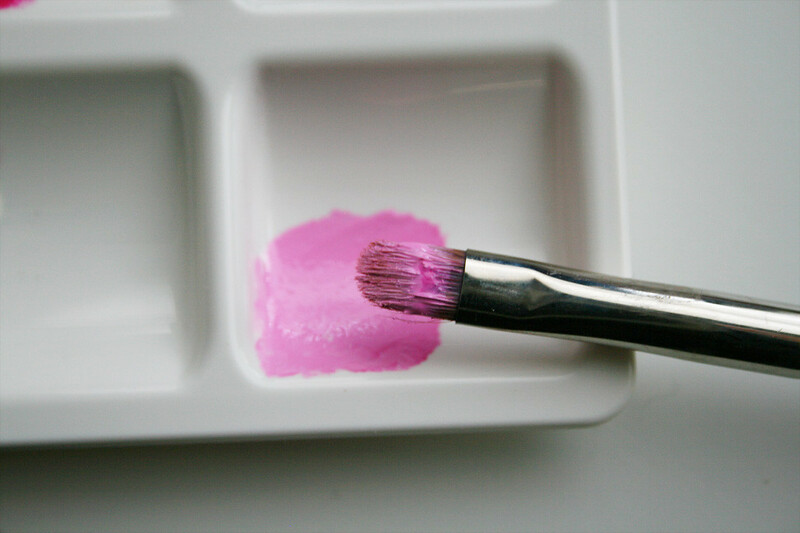 A lip brush (or small eyeshadow brush as I have) is essential to mixing and applying Lip Tars. (You could use your finger, but that's a little too messy for my tastes. However, do NOT apply these things on your lips straight from the tube. You're just asking for a lipstick blowout at that point.) You see the amount of product I have on my brush above? That's already way too much for one set of lips. This was the result of the first mix: it was a bit too cool for my skintone. Oh, well. Let's wipe it off and try again, of course. 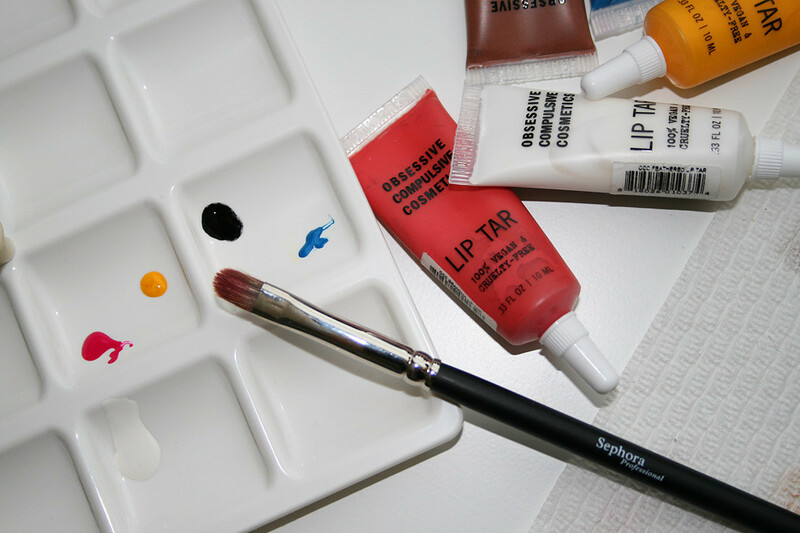 I've noticed that colors apply a little more lighter on the lips than on my palette, so I have to remember to adjust the colors to be a little darker. I added a little more of Anime, a tiny amount of Tarred, and put a couple of swipes of the yellow (Traffic), and I got a warmer and deeper color this time. That's a little better. The Lip Tars apply with a semi-matte/satin finish and have impeccable staying power. Even after wiping the product off, the residual pigments stay behind on your lips unless you're using an oil-based remover. They also have a (very brief) minty scent to them. While the Lip Tars a lot of fun, I do have two warnings: The products tend to separate, and you can see the oils separate from the pigments in the tubes when you don't use them often. 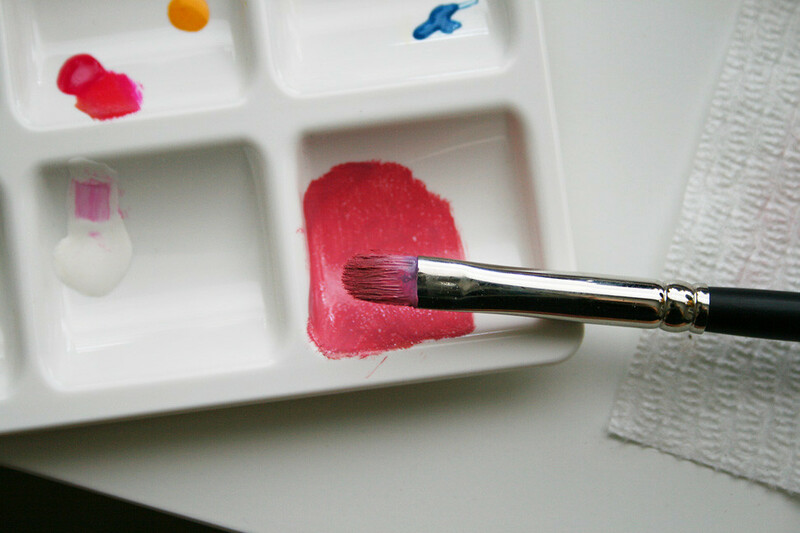 Try to mix it back while it's in its tube, and don't try to squeeze the product out on a palette and then mix. You'll often get more oil than pigment if you try that, and that ratio just doesn't mix together nicely. The second caveat is that depending how you store them, the pressure of the tubes causes the product to flow out very quickly if you're not careful. It causes quite a mess, and I try to squeeze the excess air from the tube before putting the cap back on to try to avoid the explosion the next time I open it. The only bummer is that if you've made a custom shade that you love, it's a little difficult to tote it around. You could put the mixture in a small spill-proof container, but you should bring your lip brush or hope that your finger is steady enough to apply this highly concentrated mixture. You might want to invest in some empty mini lipgloss tubes if you're really keen on bringing it along with you. I think that these have incredible value -- each tube is only $14.50, and since you only need so little and they are so versatile, I think it's worth picking a couple of these up. This post contains one or more items that were sent as product samples, promotional items and/or products from a sponsorship. For more of what this means, please see my Legal page. Happy birthday, America. Here's my patriotic tribute. 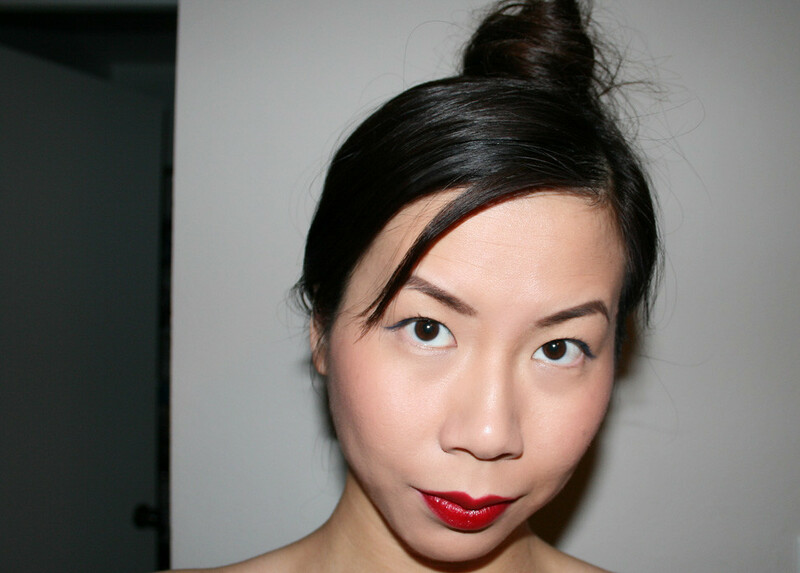 The red is courtesy of Chanel's now discontinued Rouge Allure Laque in Dragon. I had to get mine from a completely different state as all my local Chanel counters had already wiped out their entire Rouge Allure Laque line. Plenty of others have written about this color, and I will say the exact same thing: it applies beautifully, and if you weren't a believer in red lipstick, this will make you one. It's a cream lipstick that applies with a doe-foot applicator, and it has a light rose scent that disappears upon application. It stays on for hours on end, and even after I eat or drink, it still leaves a stain on my lips. In fact, I sometimes simply put on some balm and a little tiny dot of the product and use my fingers to make it appear more stain-like. It retails for $32, but if I only had to buy one true red lipstick, this would be it. All I can say to anyone trying to find one is good luck -- they're still out there, but you really have to use some investigative skills and persuasion. Yes, it's a little cheesy to use sunscreen to signify white, but the cream itself is white, so let's go with that. 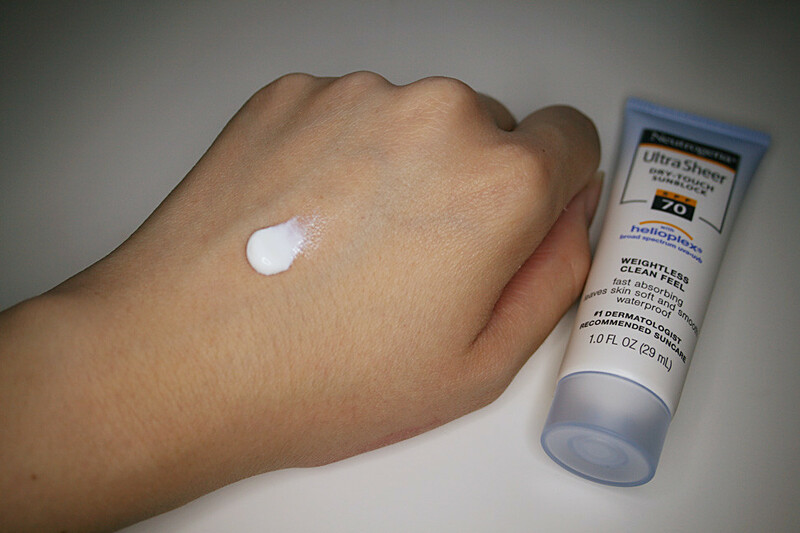 I already use a lot of face products that contain SPF or sunscreen, but the Neutrogena UltraSheer Dry-Touch Sunblock is what I use on any areas that are not my face if I'm out in the sun. I prefer creams to sprays, and although I have a couple of tubes of this cream in SPF 30 and SPF 55, I got a sample of SPF 70 in a promotional beauty bag that I signed up for from Target last month. As with my other tubes in different SPF strengths, the cream goes on smoothly and absorbs quickly. Now, I don't go out in the sun much and in fact, I really try my best to stay out of it. I don't think it's fair for me to judge the efficacy of this particular product, but if I know that I'm heading outside for a good length of time, I will put on this brand of sunscreen. For the record, I also have used those Neutrogena Body Mist sunscreen sprays, and I can't stand them. They don't seem to absorb as well for me, and I'm always left feeling sticky. 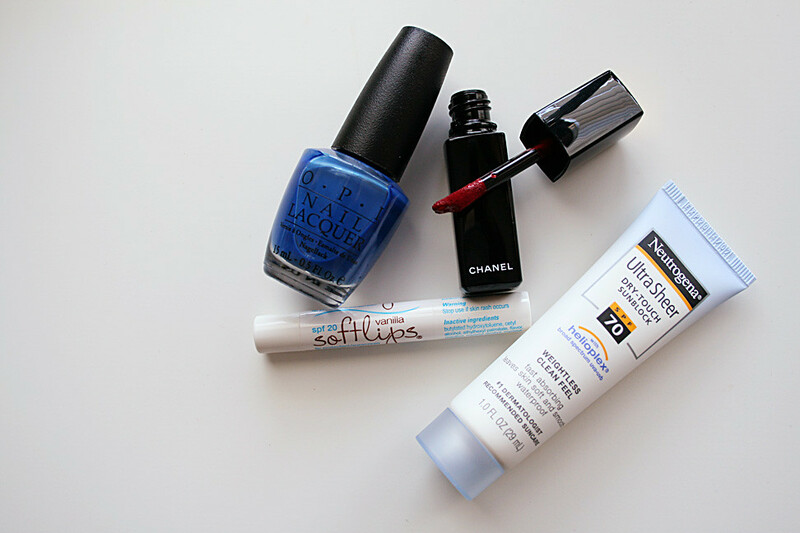 Speaking of sunscreens, I use lip balms with SPF before applying any other lip products. My lips get dry often, and I have learned to force myself to use lip balms. I resisted for a long time because I hate greasy-feeling lips or tasting the waxy balm all day. The only lip balm that I have returned to time and time again is Mentholatum Softlips Lip Protectant SPF 20 in Vanilla. Part of why I like this so much is because of nostalgia. The first time I ever purchased this was in 1998 while I was on a family trip in Taiwan. I thought the tube was really cute (first time that I saw a slim tube of lip balm -- contrast this with those chubby ChapStick tubes), and when I tried it on, it was unlike any lip balm I'd ever used before that point on. It was minty, creamy, and most importantly, didn't taste like wax. Just the smell of it these days reminds me of that trip in Taiwan. There's easily 5 of these tubes rolling around between my drawers and bags. 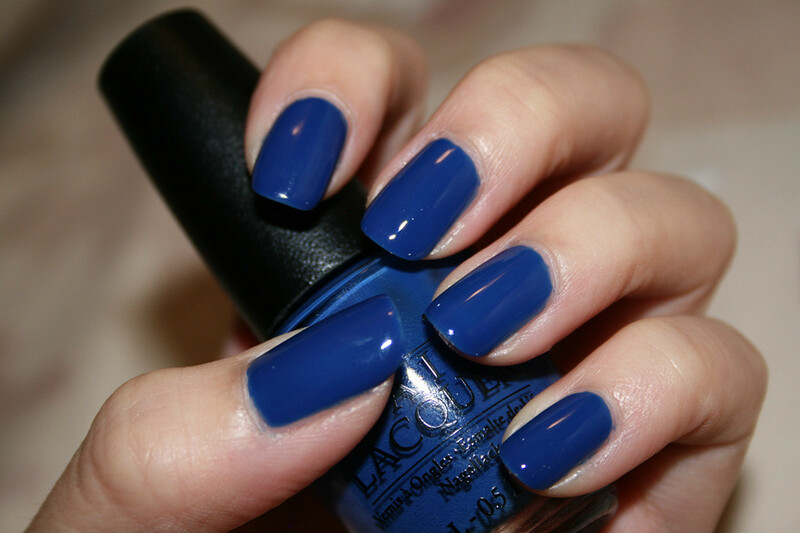 Finally, the blue is brought to you by OPI Dating a Royal. As you can probably tell, the color is a rich royal blue. The formula, however, is interesting -- it's something between a jelly and creme. This was two coats without topcoat, and it goes on smoothly (any imperfections you might see is probably due to my camera's dirty lens -- bad lens!). I think I like this color enough by itself that I don't need to embellish it or stamp any other design on it. I did buy this a couple of years ago, but I'm sure you can still find it around. There is really nothing original about this post, since clearly everyone else had the same idea with these Giorgio Armani Eyes to Kill Intense Eyeshadows from the limited edition Bronze 2012 collection. Almost every other beauty blog that I saw that wrote about these shadows bought the exact same two -- but I don't think we can blame anyone for that. There's a reason why these two colors were singing their siren song the loudest. I bought 20 Obsidian Black and 23 Madre Perla back in May, but I didn't bother trying them out until last week. To be honest, there is nothing terribly unique about 20 Obsidian Black that you couldn't duplicate with existing shades from a nicely-stocked makeup collection. It's black with a teal shimmer, so while it is a little more complex than a straight-on black, the teal doesn't really come through unless you wear a blue base. (If you think the background pattern is ugly -- you're right. Imagine having a whole couch in this pattern.) 23 Madre Perla is at least a little bit more unique. I can't quite capture the shifting colors here. It's not an icy white that you might see here, but quite a bit more opalescent with a strong pale blue shift. Honestly, if you're here looking for accurate swatches of these two colors on an arm, I would suggest you look elsewhere on the internet. Since I assume you're usually putting these shadows on your eyes and not your arm, I think a face look shows a more accurate depiction of how these shadows are supposed to look. In addition to the two Armani colors (23 on the inner eye and 20 on the outer eye), I used Urban Decay Primer Potion and Urban Decay 24/7 Glide-On Eye Shadow Pencil in Clash as bases. 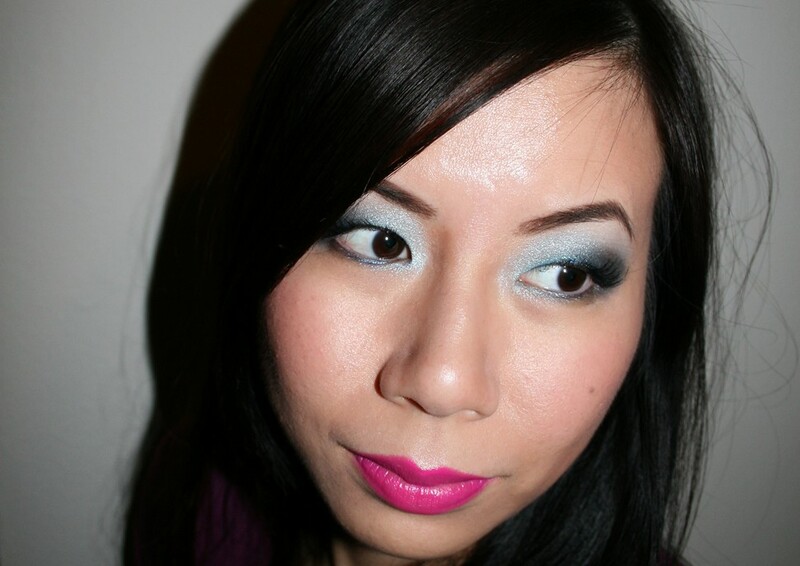 I also used the dark blue color from the MAC Mineralize Eyeshadow in She Who Dares on my lid and Urban Decay Glide-On Eye Pencil in Binge to line. 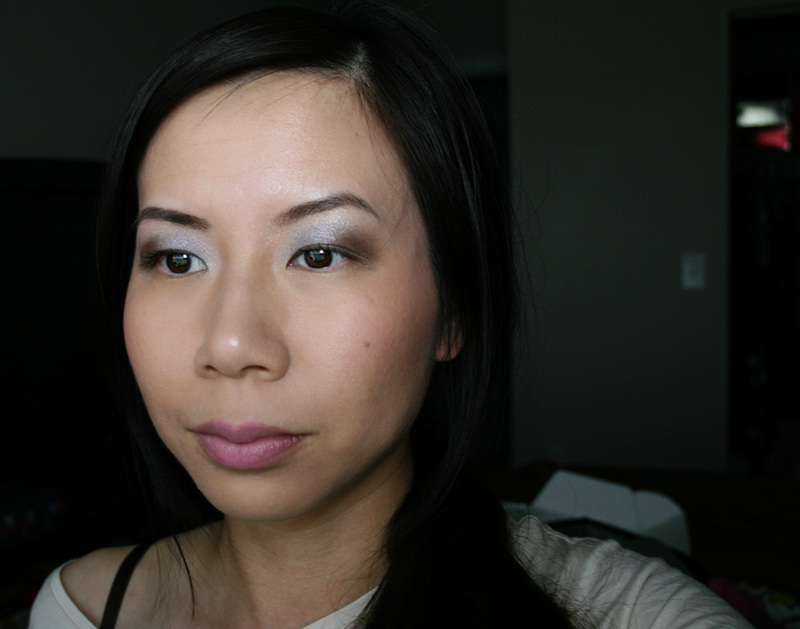 Finally, I used L'Oreal Infallible Eye Shadow in Endless Pearl to highlight. For blush and contour, I used MAC Beauty Powder in Alpha Girl and Lancome Star Bronzer Natural Glow. (I also cut up some cheap fake lashes for my outer eye.) 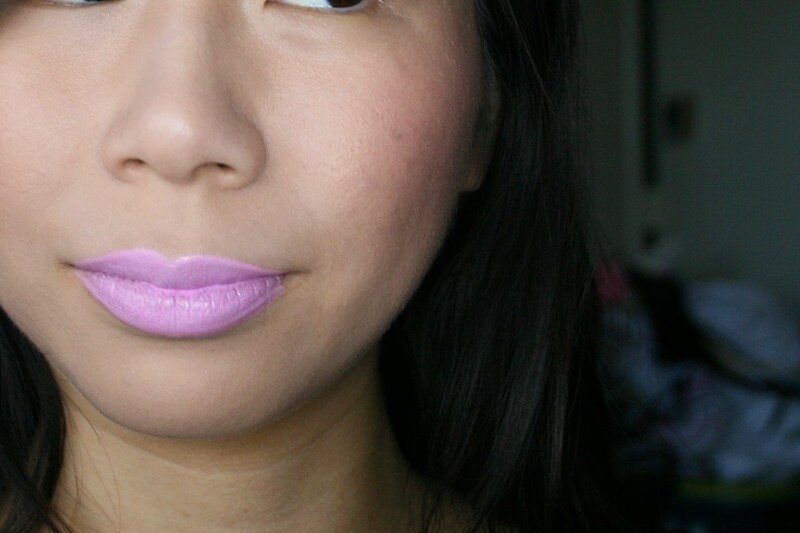 On my lips is Urban Decay Super-Saturated High Gloss Lip Color Lip Color in Crush. I asked myself why I got these if the colors weren't terribly unique (particularly 20 Obsidian Black), and the reason is because I can't resist the formula. 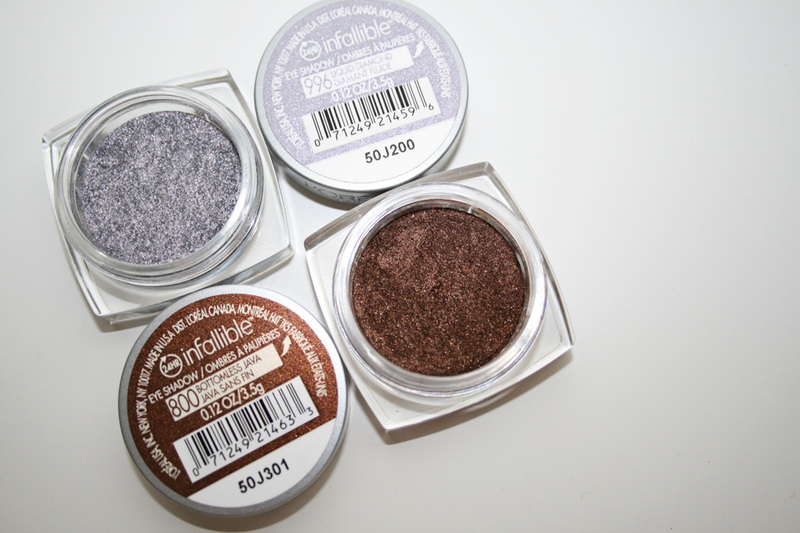 I compared the L'Oreal Infallible shadows to the ETK Intense in an earlier post, but the truth is is that the the ETK Intense formula is even more buttery and smooth than the L'Oreals. There's only two issues that I have with the ETK Intense: 1) There is a little bit of fallout from these shadows, so I would recommend damping your brush (you can dip a dry brush into the shadow and then spray the brush with a light setting mist as I do) to prevent the fallout, and 2) These things are $32 a pop. I own 7 of these ETK Intense shadows now (don't do the math don't do the math), and I'm sure I'll pick up more of them in the future. I pulled out a previously purchased color for a comparison against 20 Obsidian Black -- 13 Black, which is the top swatch on this picture. You can see that 13 is much darker with hints of navy while 20 is more of a murky seaweed. With a price like these, I would recommend that you visit a local Giorgio Armani counter and test these out to decide whether they're right for you. (You should also hit them up for some foundation samples, too.) Although I think the formula of these shadows makes up for whatever the high price might be, you do get a lot of product for what you're paying for. 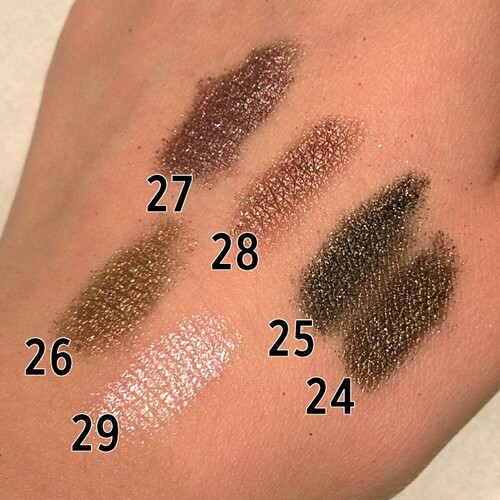 And if after swatching at a counter you find that these are not right for you, I would still recommend the L'Oreal Infallible eyeshadows as a decent alternative. Of course, everyone is abuzz about Fiona's latest album, The Idler Wheel... After listening to the NPR stream of the album for several days on end, I finally purchased the deluxe version. One of the things about buying music for me these days is that if I am buying it, I want the biggest and baddest version that doesn't veer on gimmicky. 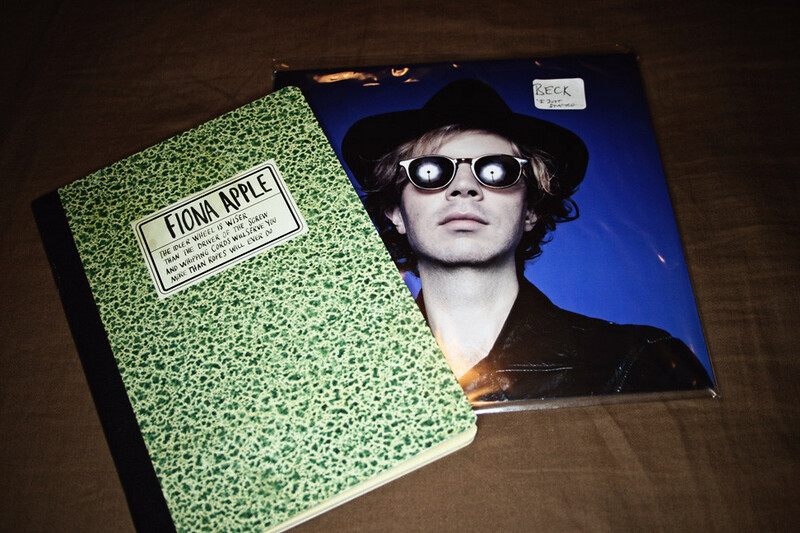 All of this is to say that the deluxe version of Fiona's album is worth it. 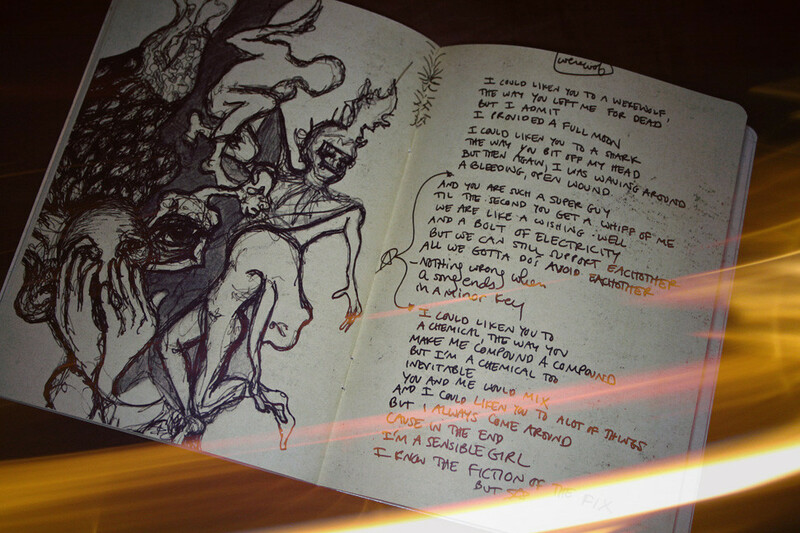 Beautifully made and curated, it contains reproductions of her drawings, notes, and lyrics in her handwriting. As for the music, it did take me a couple of listens to appreciate it all. At first, "Jonathan" was a bit unnerving, but I think that was the whole point. It's easily one of my favorite tracks on the album now. "Werewolf" is a poignantly written and melodic piece -- but like some have pointed out, I think I could do without the screaming kids at the end (protip: turn off the audio from your right channel when you get to 2:08). There are a couple of songs that I have a tendency to skip over, including "Valentine", "Left Alone" (awesome lyrics, but the mix is so instrumental-heavy), and "Periphery". The final track on this album is "Hot Knife", and because I'm a sucker for (mostly*) vocal-only performances (see Björk's Medulla) and looped/layered vocals, I have to admit that this is my favorite song on the whole thing. *Yes, there's percussion and piano on this track, but it's minimal. This edition also came with a DVD of her performance at the 2012 SXSW conference, but personally, it's a bit of a throwaway inclusion for me. Although I don't like to compare one album against another in an artist's oeuvre (I try my best to separate album from album), I like The Idler Wheel... better than Extraordinary Machine, but I still find When the Pawn Hits... to be my favorite Fiona record. Here's my confession: I'm a bad Beck fan. I was really devoted from Odelay* through Guero, but I never bothered picking up anything else onward. (I did listen to the singles from the last couple albums, though.) As I'm writing this, I decided to listen to his complete discography on Spotify as penance. *Bonus story: I was in middle school when Odelay came out, and although I listened to the album over and over again, no matter how many times I heard it, the opening to "Lord Only Knows" always scared the crap out of me. Beck's "I Just Started Hating Some People Today" is completely what you expect Beck to put out. There's a country-folk vibe mixed with lyrics about wanting to punch your face and nunchucks. The last minute-and-a-half of the track dissolves to a fast-moving punk piece and then segues into a jazz lounge number. (Honestly, it's probably better that you listened to this song first without reading this description -- it's a much more fun and unexpected ending.) 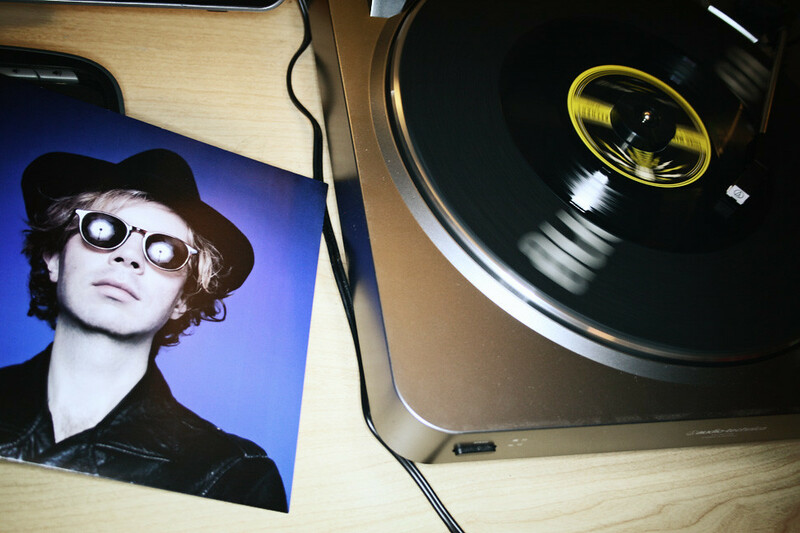 The B-side is "Blue Randy", which is more musically straightforward, but is all Beck lyrically. The only bummer is that I'm pretty sure I need to replace my record player needle, and I'll have to wait to transfer the 7" vinyl over to tasty digital bits. If you ask me what sort of coffee I prefer, I would answer that I don't. (I'd love some hot tea, though.) Diamonds, on the other hand, I'm ambivalent on. Sure, they're pretty, but I don't particularly seek them out. 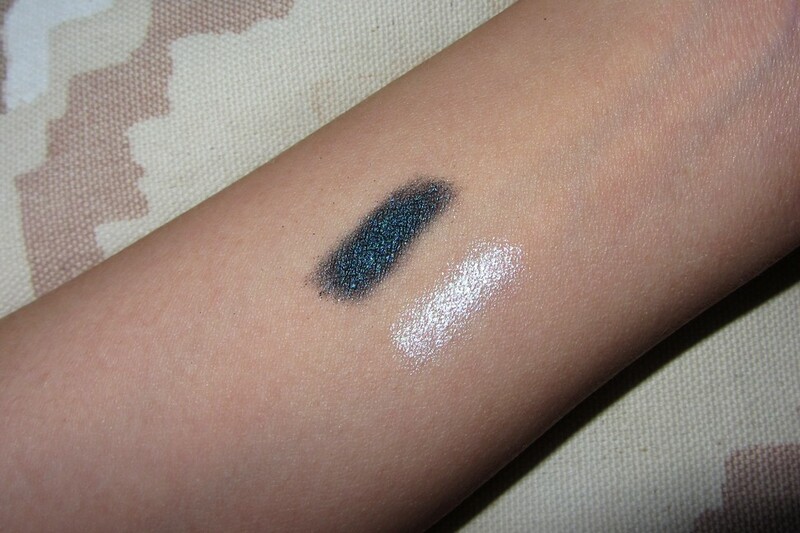 When I encountered L'Oreal's new Infallible Eye Shadow in Liquid Diamond and Bottomless Java, I knew I had to have them. I've collected a good amount of these shadows, but I try my best to get unique colors and/or nicely pigmented ones. 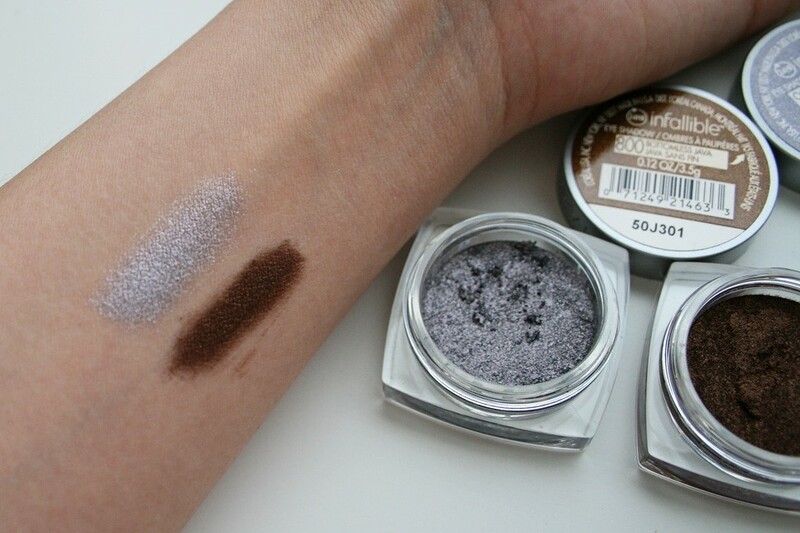 And yes, like some have suggested, they have a very similar texture to those lovely Giorgio Armani Eyes to Kill Intense eyeshadows (which I adore as well). The complexity of Liquid Diamond is what drew me to this color. It's not quite what I would picture crushed diamonds would look like, but it's a mix of lilac, silver, and pewter. Bottomless Java is not as complex, but it is a rich red-cocoa. 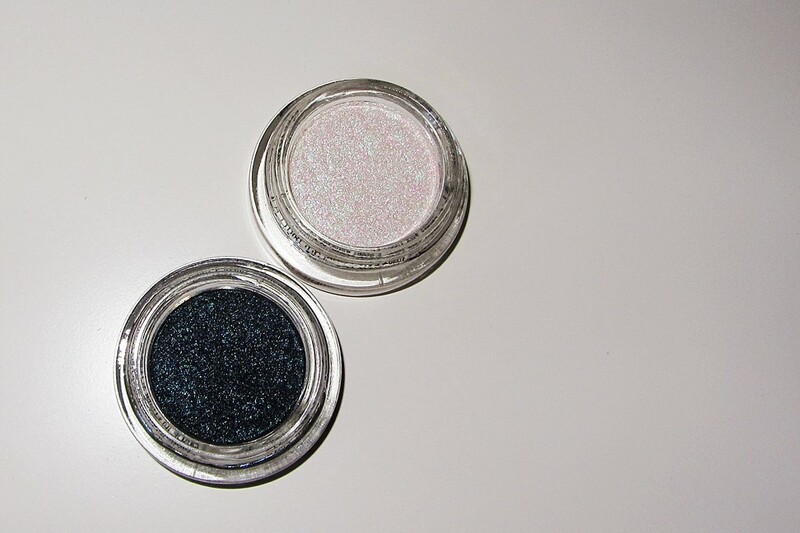 None of the Infallible Eye Shadows I have encountered have chunks of glitter, so like the other shades I own, both of these colors go smooth. 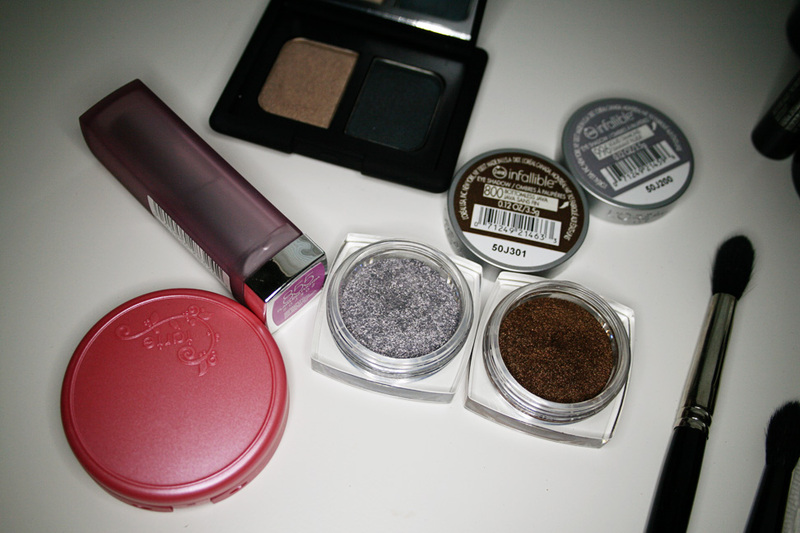 I whipped up a quick look with the two shadows, with a little help from some of their other eyeshadow friends. I don't think I would have naturally thrown these two colors together, but it didn't turn out too bad. 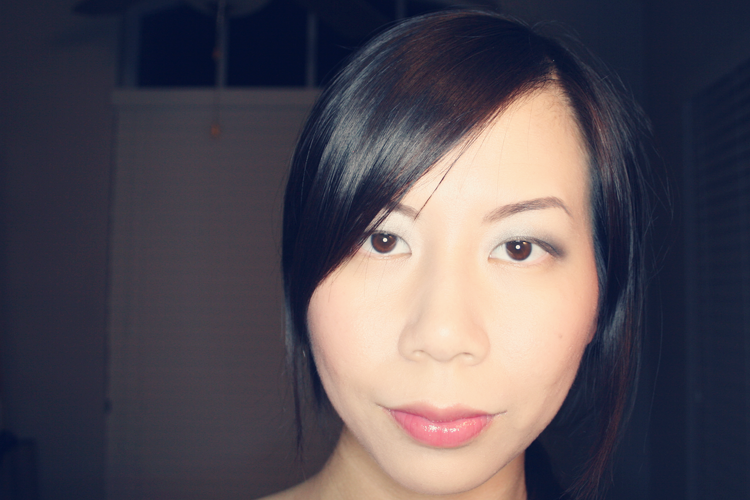 Along with the two shadows, I used the beige color from the NARS Rajasthan duo and MAC Magic Dust. 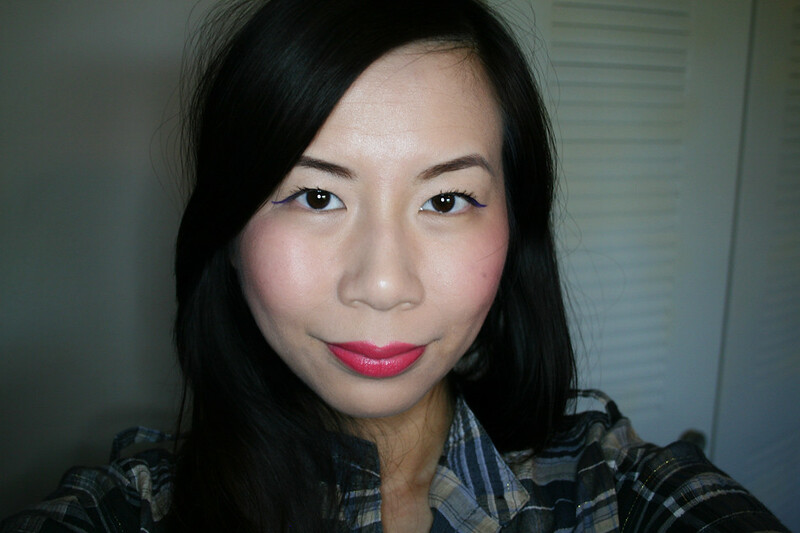 On my cheeks is Tarte Amazonian Clay Blush in Dollface, and the lipstick is Maybelline Flawless Fuchsia. As for the wear of these shadows, they do fine for a good number of hours with a primer beneath. (I'm not going to try to test the "24-hour" claim of them, though.) With primer or base, the colors show up very deep or bright (depending on the color, of course). I did try to scrub my arm swatches off in the shower, but still had residue and had to get my cleansing oils off to remove it. I'll continue to buy these Infallible shadows as long as they come on in unique colors and retain their wonderful texture. Drugstore/Ulta sales and coupons also make the deal much more sweet (for example, I only paid $6.50 for both colors after a BOGO1/2 deal, Ulta coupon, and manufacturer's coupon). Well, this is about the fifth incarnation of my blog. Low motivation coupled with lack of more interesting things to say brought the demise of the other four. But now I'm back (again). I promise to let you know when I've abandoned this one, though. My name is Mariana, and I'm a twenty-something living in Florida. I like a number of things, none of which I'm sure are truly unique out in the big blog world. My passions currently are music, cosmetics, food, and lively debates. Although I like to review things, I prefer to take my time and do more comprehensive reviews. This might mean it may take anywhere from a day to a couple months before I review any particular music/makeup/food item. I'm looking forward to writing on a somewhat regular basis, and I looking forward to developing a healthy and equal dose of snark and camaraderie with others.